Ahhhhh, so very cute! 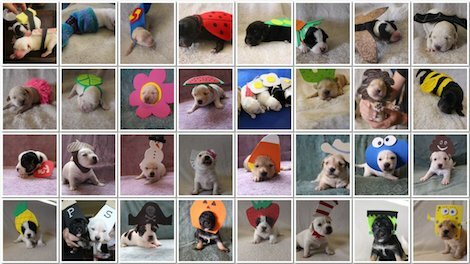 These pictures will literally melt your heart, as a farm in Texas called Blue Heron Farm, have put together a collection of thirty-one dogs who all dressed up in different costumes to celebrate the month of Halloween. If that wasn’t cute enough, most of these dogs are new-born puppies! Blue Heron Farm have really gone all out this year, and have come up with some very creative costume ideas. I’m going to cry, I can’t deal with this much cuteness. I wonder what their plans are tonight…watching Borkus Pocus, Trick or Bamboozling, or perhaps they’re going to heckin’ party the night away with their pals, who knows? We think the farm have done a wonderful job creating these costumes, and an even better job getting the pups in them! Happy Halloween! Which costume was your favourite? Do you think the pups look heckin’ spooky? Let us know in the comments, or on Twitter at @WhatsTrending.